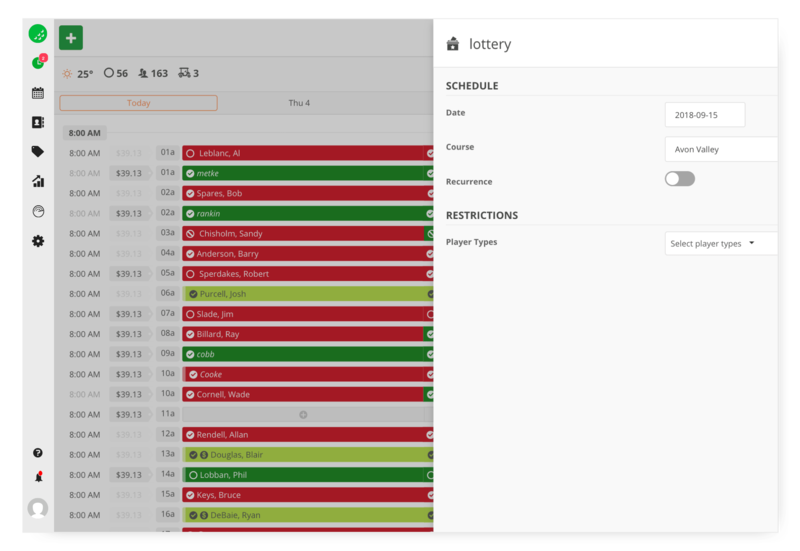 Create lotteries or draws that allow participants to cast their preferred choices. Identify player categories that are allowed to take part in the draw. Automatically assign choices on the online tee sheet based on a point system. Manage conflicts and restrictions. Having proven to be a successful formula for both the airline and hotel industry, Dynamic pricing can be used to increase or decrease rates using variables such as: Days in advance, Time of day, player type and Occupancy percentage. Dynamic pricing is a great way to maximize your revenues without increasing your marketing dollars. Give your members and customers a new and superior experience on their mobile. Our online tee time software is built for both semi-private and private facilities. Manage standards, shotguns, crossovers and front/backs in a few clicks. Our tee sheet handles any scenario and updates in seconds. Let your members and public players book a tee time straight from your website with any device through our booking system. Our mobile-friendly booking solution is tailor for golf course operations with members and public players. Allow members to see the full tee-sheet and book alongside other members. Access the member directory and invite other members in your reservation. Keep track of account invoices and pay your bill online. Request public golfers to pay online or offer two options: pay at the course or pay online at a small discount. Reduce no shows and take control of your promotions. Manage all your events efficiently. Allow customers to register into an event and book into a league or tournament. Manage recurring leagues. Empower league captains and tournament organizers. Keep track of attendance and no shows. Offer online payment. Provide a personalized service to your members. Allow them to see and book on the tee-sheet alongside other members. Manage various member categories and playing rights. Choose your booking range per player category. Manage membership life cycles. Allow your members to charge on account at the pro shop and food & beverage. Manage credit limits and deposits. Let your members consult their statement online. Email statements. Allow members to settle their bill online or request payment at the facility. Track inventory through a purchase ordering system. Manage multiple product variations. Load your entire inventory at once. Create boxed items. Update stock levels through inventory counts. Manage inventory cost through average costing or other accounting methods. Identify your most profitable items. Improve efficiency through integrated payments. No need to key in the amount on your payment terminal anymore. Create and process gift cards, with no processing fees, building customer loyalty and making payment easy. Create customer profiles on the fly. Add contact information, product preferences and see booking and purchase history. Target the right customers with the promotions they want to know about. Identify your most profitable customers. Integrate our tools with the leading email marketing system in the world. Mailchimp makes emailing easy. Flexible templates and designs to choose from. Automate your email campaigns. Build your lists and manage your subscribers. Advanced analytics to grow your business. CASL compliant. Looking for a complete golf course POS system? Look no further! Our golf POS is tailored for your pro shop operations and is fully cloud-based. Check in golfers in seconds with custom tender methods. Add items with your bar code scanner or by searching through your catalogue and update your inventory in real-time. A complete food & beverage point of sale ideal for table service and quick serve. Take orders directly from the table with our iOS app. Send orders over to the kitchen and bar. Use it with your beverage cart. Track inventory and customize your floor plans. Powerful tools that let you take control of your marketing and promotions. You don’t have to rely on third party discounters anymore. Increase your occupancy rate. Reduce your no shows. Yield your tee-times. Offer happy-hour prices at the restaurant. Run special promotions on specific items at the pro shop. Manage your ticket books with a digital system that allows you to track redeemed rounds, multi-beneficiary packages and much more. Identify tee-times that are under-utilized and sell them online, directly from your tee-sheet, by providing a discount that can be redeemed on your website. Sell your inventory online. Design your own webstore or use one of thousands of templates. Synchronize on premise and online sales. Integrate your webstore with various online payment options. Drive sales during the off-season. E-commerce made easy. Chronogolf.com attracts thousands of public golfers in your area looking for a tee-time nearby. Keep a pulse on your golf course by tracking tee time occupancy rate by time ranges. Identify your top selling tee-times and target your weaknesses with our marketing tools. Compare with previous days, months or years. Compare with the weather forecast. Over 100 reports included. Learn everything you need to know about your facility. Items sold, total sales over a period of time or averaged per hour, day-specific profits by product categories. Access your reports from anywhere, at the club, on the go or at home. Managing register closures has never been easier. Keep track of every single register closure report dating back in time. Identify errors in seconds. Make changes from anywhere. Track revenue, cost and profit per GL account. Break down your revenue per payment method and tips. Allow for single or multi-tax charges. Identify your best selling products and your worst performers. Tag vendors and suppliers. Track product sales by customer. Update stock levels through an efficient inventory count system. Complete purchase orders in seconds. Generate an asset report efficiently. Track employee work hours through the clock-in-clock-out functionality and track employee sale progress. Identify your best selling staff members. Customize employee roles for better security control. Keep track of transaction logs per employee. Automatically push register closures into QuickBooks Online, QuickBooks Desktop and Xero to reconcile with your books and keep your accountant happy. Map each revenue stream and cost of goods sold. Works seamlessly across your devices so you can keep up with your business wherever you are. Chronogolf is transforming how 600+ golf courses worldwide manage their operations. To use the system, it doesn't take long to catch on. Everything is more efficient. It's accessible at any time. The team at Chronogolf was extremely helpful, always on call whenever we needed them. I don't think it could have gone any better to be honest.